All grip, no slip. 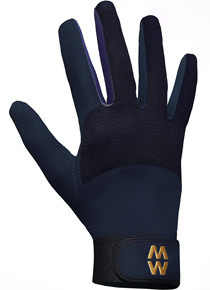 That is the mission statement of these fantastic MacWet Aquatec® long mesh sports gloves. Great grip is crucial in a variety of activities, including golf, horse riding, watersports, shooting, fishing, cycling, paragliding and much much more. Even in the wettest conditions MacWet gloves will give you 100% grip so your performance isn’t hindered. The long glove finishes just above the wrist and has a thick elasticated cuff for a secure fit. The glove fastens easily using a durable Velcro strap. Achieve maximum grip with MacWet Aquatec ® long cuff mesh sports gloves.